This festive beer special is a reminder and a celebration of Slovak brewing skills. Delicately combines “a liquid gold” as honey is called with the rich taste of beer. The perfect harmony of the sweet taste and the aroma of honey with several types of malt and bitter hops became popular choice among Slovak consumers in the last 6 years, since 2013 until 2018. 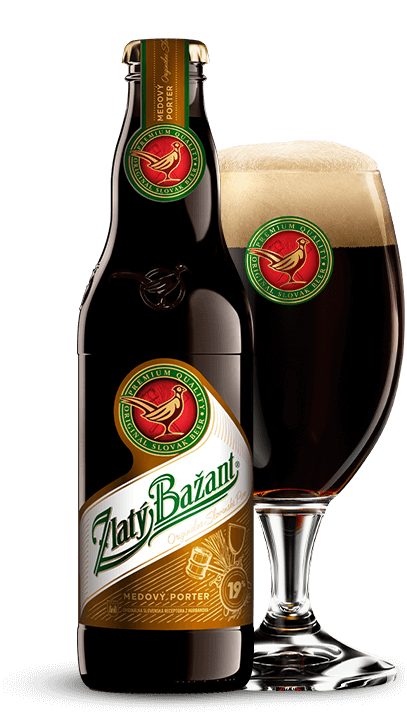 Zlatý Bažant Honey Porter is characterized by rich, almost black color, thick, slightly brownish foam, distinctive spicy bouquet, moderate bitterness and a delicious malt flavour with a touch of sweet honey. This unique experience is the result of sticking to traditional recipes, a combination and careful selection of four exeptional malts, a high beer brewing mastership and adhering to the right maturing time. Porter is a high-gravity dark beer with a tradition dating back to the 18th century. It is an evidence of a high level of brewing mastery and its distinctive flavor and aroma profile make it suitable for exceptional events of the year.